The Asimov Memorial Debate, shown here in a previous year, is an annual event by the American Museum of Natural History's Hayden Planetarium to spotlight pressing questions issues in space exploration. The 2014 Asimov Memorial Debate will discuss private and commercial spaceflight. NEW YORK — From space tourism to mining asteroids, space exploration has entered the commercial era. Tonight (March 19) aerospace industry leaders and space historians will debate the private space travel movement and you can watch it live online. Astrophysicist Neil deGrasse Tyson, host of Fox's "Cosmos: A Spacetime Odyssey," will host tonight's 2014 Isaac Asimov Memorial Debate on "selling space" at the American Museum of Natural History, Tyson is director of Hayden Planetarium. 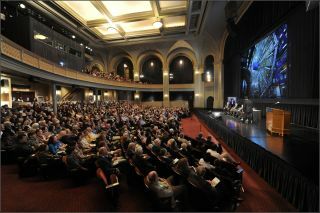 You can watch the private spaceflight debate live on Space.com, courtesy of AMNH, here beginning at 7:30 p.m. ET (2330 GMT). Tickets for a simulcast are also on sale online. Astrophysicist Neil deGrasse Tyson, director of the Hayden Planetarium in New York City, hosts the Asimov Memorial Debate at the American Museum of Natural History. Panelists for tonight's commercial space debate include: Michael Gold of private space station company Bigelow Aerospace; analyst John Logsdon of George Washington University; Elliot Pulham of the non-profit group Space Foundation; Tom Shelly of space tourism company Space Adventures; and Robert Walker of Wexler & Wexler Public Policy Associates. The Hayden Planetarium hosts the annual Isaac Asimov Memorial Debate in honor of Isaac Asimov, one of the world's most influential science fiction authors and a friend and supporter of the museum. The aim is to debate "pressing questions on the frontier of scientific discovery." Proceeds from the ticket sales benefit the planetarium's science and educational programs. In previous years, Asimov debates have centered on the existence of nothing, evidence for faster-than-light neutrinos and the theory of everything.